When will my medical bills get paid after I’ve been involved in a car accident? After a car accident, not only is it important to make sure that your health is taken care of, but it is also very important to make sure that your car gets taken care of properly as well. If your car has been totaled, you have the option to have your car taken to the tow yard, a repair shop, or your residence. If you have the car taken to the tow yard or the repair shop, it will accrue storage fees while it is there. If you have the car taken to your residence, you will not have storage fees, but you will most likely need to have space to park your car to avoid parking it on the street. If you park your car on the street, it is possible that you will get ticketed by the city. 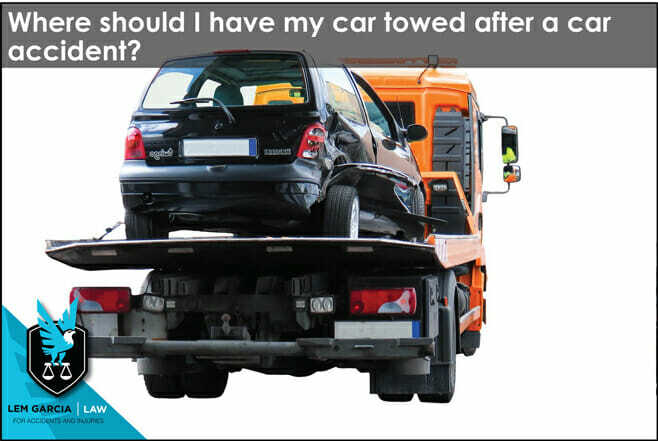 If you were not at fault for the collision, the other party is responsible for the towing bill and the storage fees, but you do have a duty to mitigate your damages, which means that you will need to get your car out of the tow yard as soon as possible to avoid the storage fees from piling up. In an attempt to avoid storage fees from piling up, we recommend that you choose to get your car towed to your house instead of a tow yard or repair shop. Both tow yards and repair shops can charge you storage fees for your vehicle at their place of business. The concern with having your car towed to your house is that you might not have space for your inoperable car. It might block your driveway if you have it placed at your house. It is also possible that you will get ticketed for your car if you have it placed on the street outside of your place. If you can have the car parked somewhere at your house without these problems, have your car taken to your house. Lem Garcia, is a car accident attorney in West Covina, and helps people who have been injured in car accidents with their property damage claims as well.